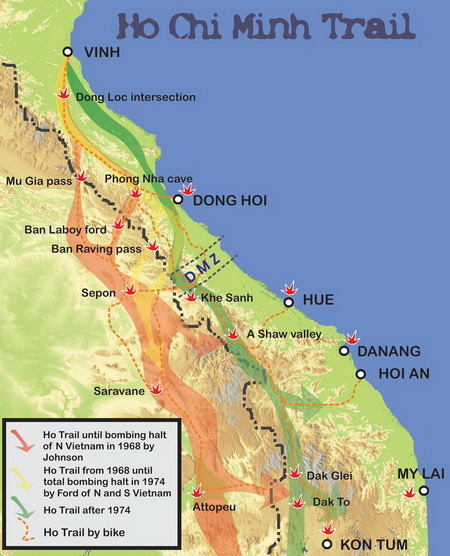 The Ho Chi Minh Trail enabled the North Vietnamese to keep communist forces fighting in South Vietnam. It grew from a humble foot trail in 1959 to an enormous 20,000km network of truck roads, foot trails and river ways by the war's conclusion. It was arguably the greatest engineering achievement of the 21st century, considering it was constructed primarily by hand under a deluge of bombs. 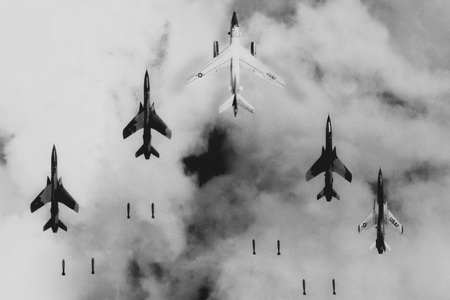 On average a US plane dropped its bombs on the Trail once every eight minutes, 24/7 for nine years. 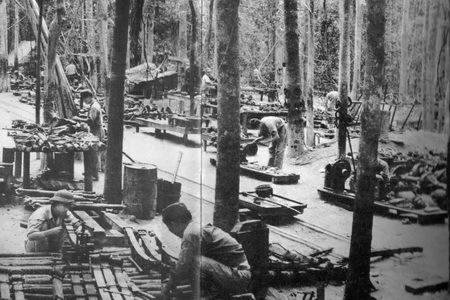 The Trail was primarily in Laos because the ground there was flat, more densley covered in forest and jungle, and of course there were no US ground troops stationed there. And it was the shortest way from Hanoi to Saigon. 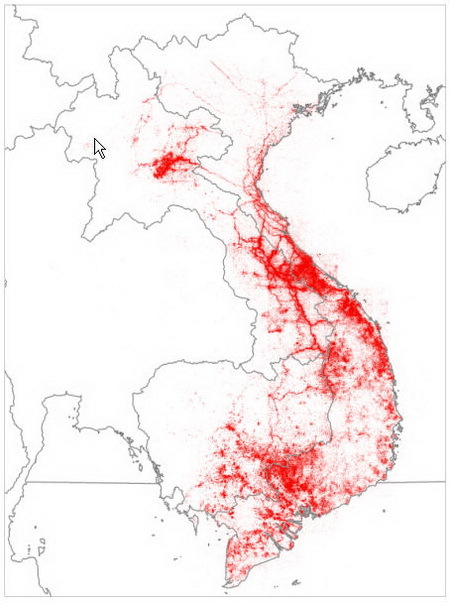 Each of the small red dots represents one sortie, or attack, by USAF planes. 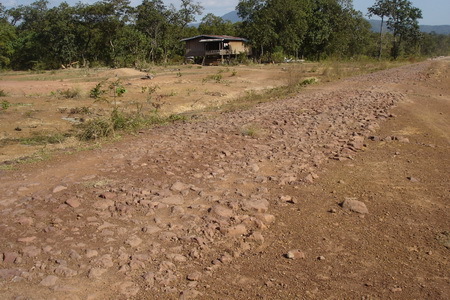 The Trail in southern Laos was attacked some 600,000 times. This map should give some idea of the complexity of the Trail. This is just the central part of it. 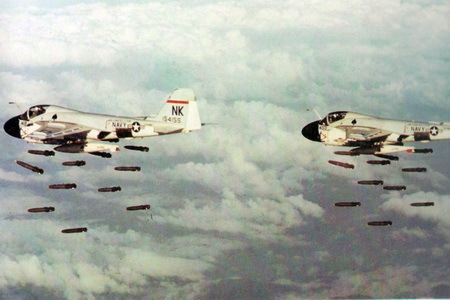 Vietnamese generals were always bemused that the US concentrated its efforts on bombing North Vietnam and fighting in a conventional manner against irregular Viet Cong guerrilla troops in South Vietnam, rather than blocking the Trail and the supplies that it fed to the war down south, from the outset. 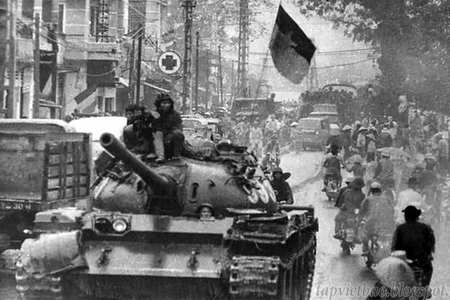 This is an iconic photo of North Vietnamese Army (NVA) troops passing through the Tha Me area, south west of Sepon. 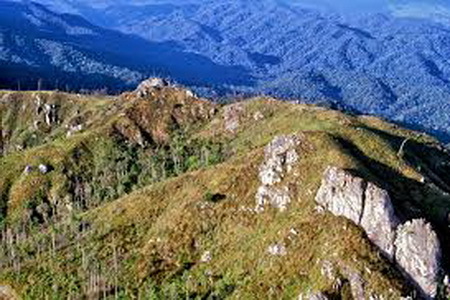 Luckily the views are just as good now, and better still, you can ride your motorbike bike up there. 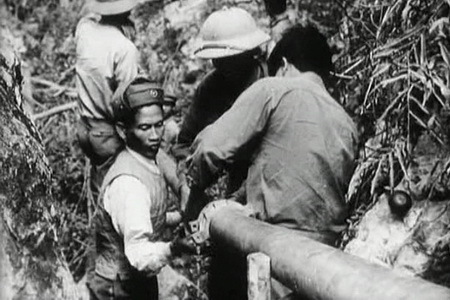 General Giap visits troops stationed at the infamous Phu La Nic pass, which was a natural choke point and hit extremely hard by bombing. 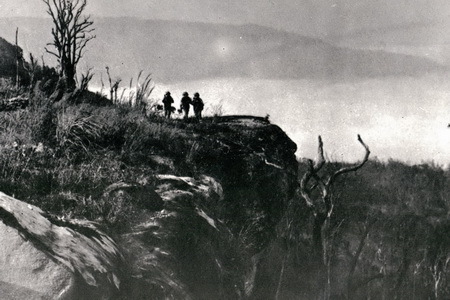 This photo is taken just up the hill from where the photo to the left was taken. 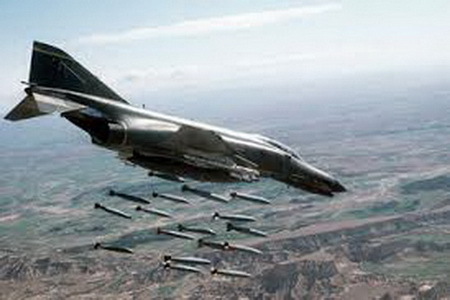 A Phantom F4 in action. Notice the wing tips which are at a different angle to the main wings. A wing tip from a downed Phantom F4 jet in the Mu Gia pass areas, one of 40-odd planes shot down in this region. 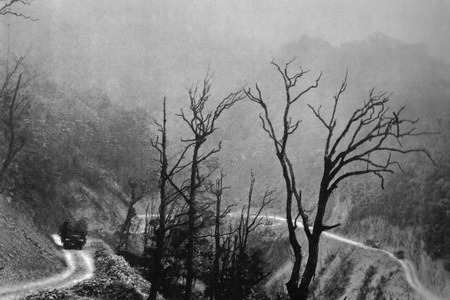 At any given time there were anything from three to six thousand trucks operating on the Trail. They were a prime target. 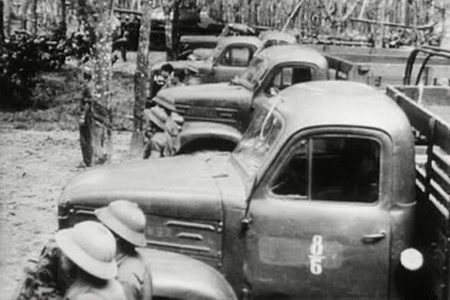 Trucks were heavily camouflaged, and typically traveled only at night, back and forth between way stations. Notice the bullet holes in the roof. 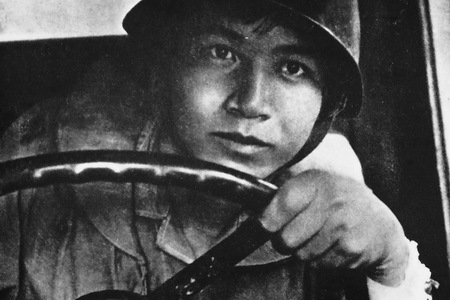 Each driver would ply a specific route, night by night. This tank, north of Attepeu, did not make it though. North Vietnmamese tanks driving through Saigon at the end of the war. In 2016 the area around the tank was swept for UXO. 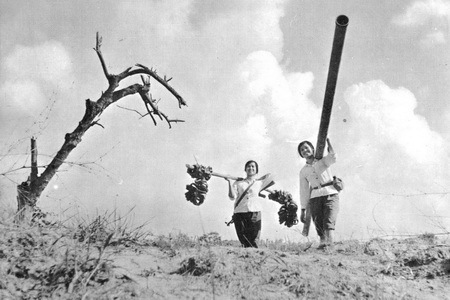 No less than 38 cluster bombs were found the area seen in this photo. 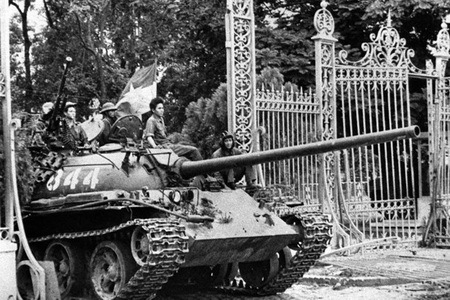 A captured US tank used by south Vietnamese forces during operation Lam Son, an unsuccessful attempt at blocking the Trail. 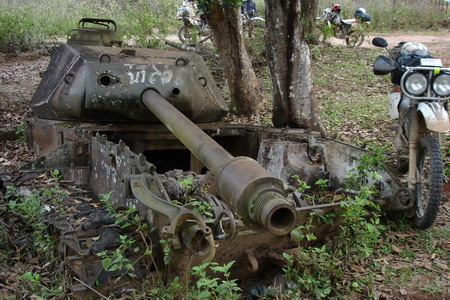 A similar tank, from the same operation in 1971, that incurred 50% casulties, left abandoned in the village of Ban Dong in central Laos. 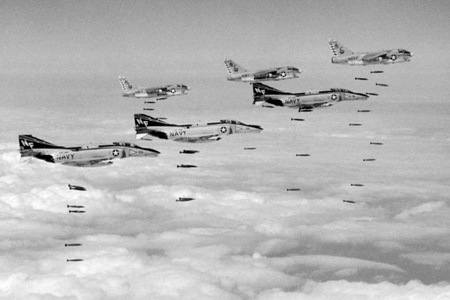 Thud F105 jets in formation. Interesting approximation in a house east of Saravane. 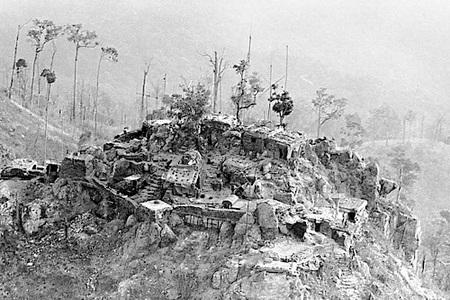 The HQ of the 559 Engineering Corps was some 200m long and hidden in the hills to the west of Sepon. That is until a collapse caused it to be moved at the end of 1968. 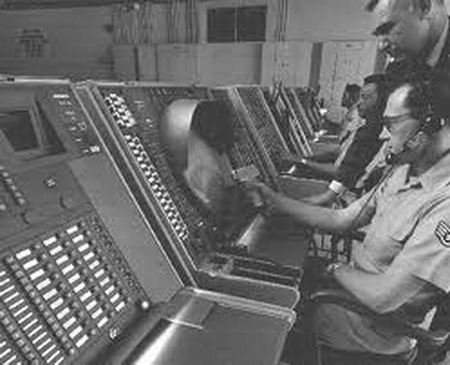 It housed over 8 offices, and some 100 staff, including a switchboard. Its western entrance is all but lost in the jungle now. 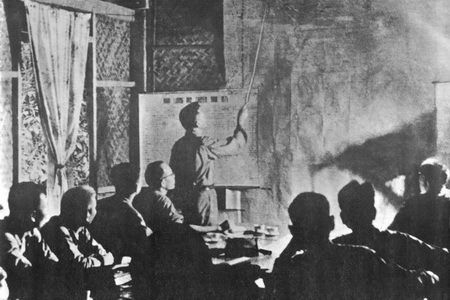 Nguyen Dong Sy instructs the high command once the 559's headquarters was relocated back to Vietnam. 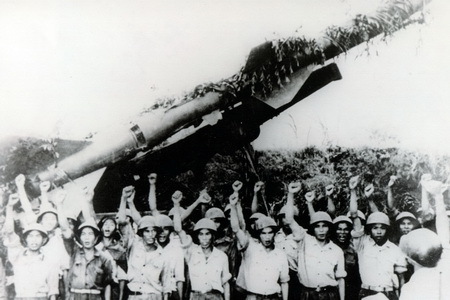 I found out its exact location by tracking down a former Vietnamese colonel who worked there as the anti aircraft commander. RPGs were a cheap, simple and formidable weapon. And on certain parts of the Trail, they litter the jungle, like here in Ban Bak. Seen here as a pretty flash indicator light on a truck. Local farmers make good use of old mortars as cow bells. 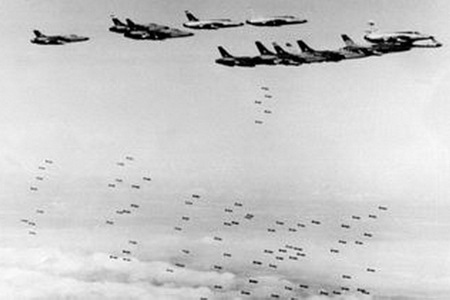 All told some 2 million tones of ordinance was dropped on Laos, making it the highest per capita country bombed on the planet. Many of the bombs remain unexploded. Heading out to Ban Laboy ford. A live 500 pound bomb, just off the track, north of La Hap. 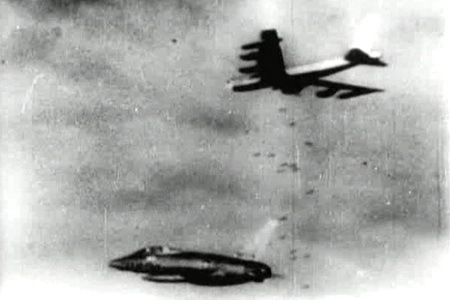 One load from a B-52. 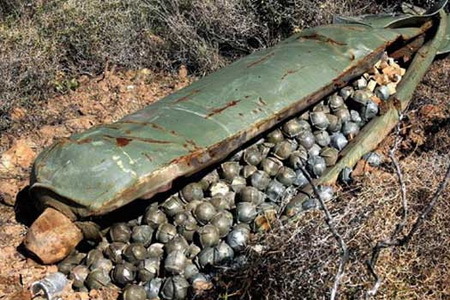 Two live 500 pound bombs in Ban Phanop village. 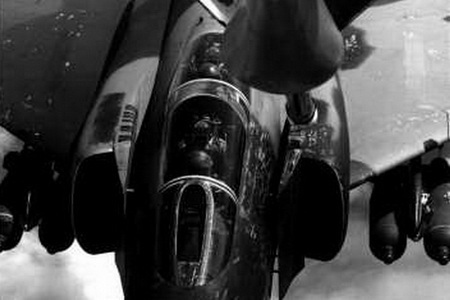 F-100F Super Sabre escprts a B-52. A unexploded 500 pound bomb in the hills above La Hap. 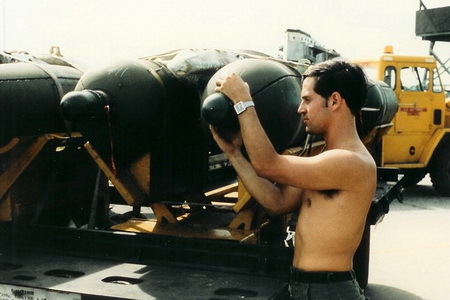 2000 pound bombs in Saravan. 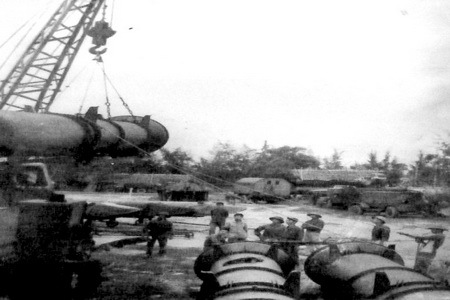 750 pound bombs at the Mu Gia pass. 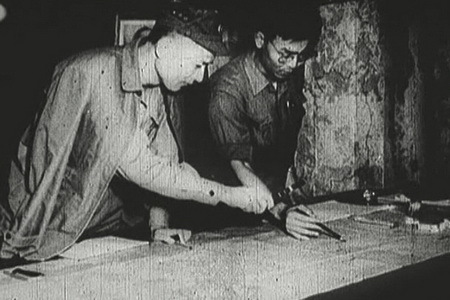 Nguyen Dong Si, the chief of staff for the 559 Engineering Corps that managed the Trail, meets with an AA gun crew. Similar helmets in a village near the Mu Gia pass. 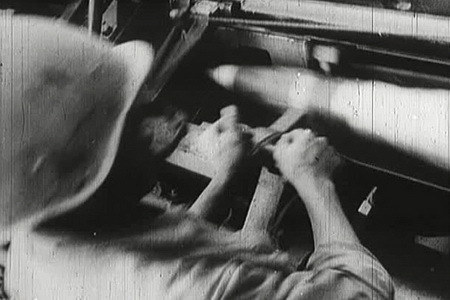 AA gun crew in action. Their helmet now used to grow onions. 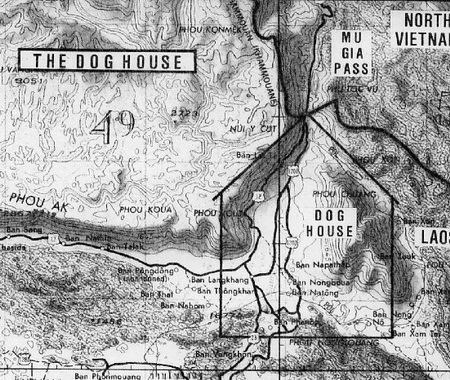 The Mu Gia pass was notorious with pilots and almost 50 planes were shot down there. It was called the Dog House. 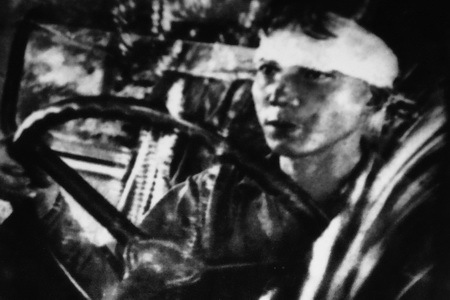 It was one of two main routes where Vietnamese trucks passed into Laos. 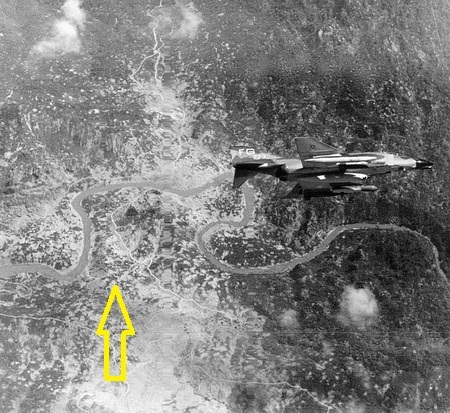 One such unfortunate Phantom pilot was shot down just south of the Mu Gia pass, and if you click on the above photo, you can read the story of his dramatic rescue. Ban Karai pass. 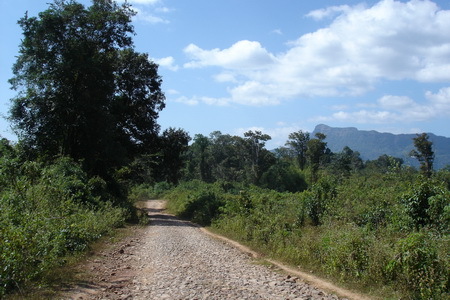 The other main route into Laos, which also had to negotiate the notorious Ban Laboy ford and the Phu La Nik pass. Many sections of the original cobblestones remain to this day. Though many are being covered by new roads. 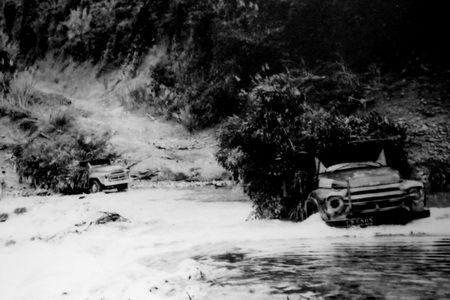 Ban Laboy crossing was the most heavily hit river crossing. Two US pilots return with us to the exact same crossing in a vintage US army jeep in 2013. 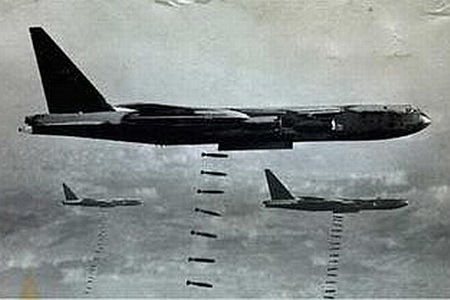 One crossing point, called Ban Laboy, is reckoned to be the most heavily bombed place on the planet. The rocks in the centre still show the scars of bombing. This photo was taken from the middle of the left hand side of the photo opposite looking to the right. 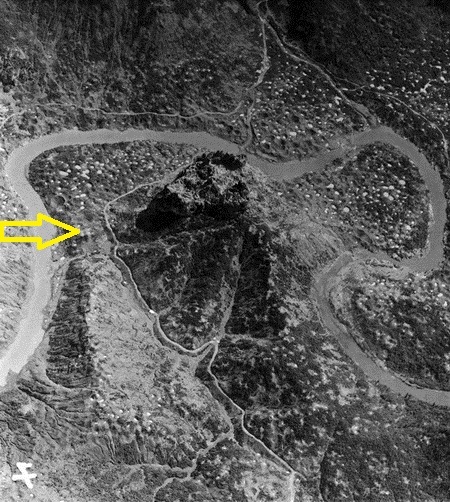 Nicknamed the 'Dogs Head' by US pilots, it was a natural 'choke point' which involved a river crossing and a steep pass that the trucks had no choice but to traverse. This photo was taken looking down on the same set of rocks, but from a different angle. 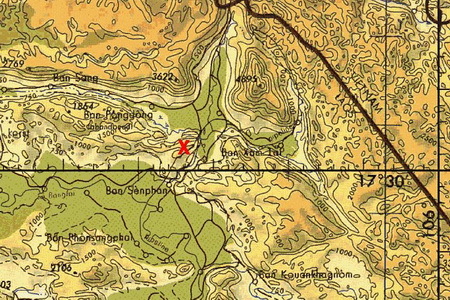 The intersection at Lum Bum, where route 20 (the road over Ban Laboy) met route 128 (the route which crossed over at Mu Gia. 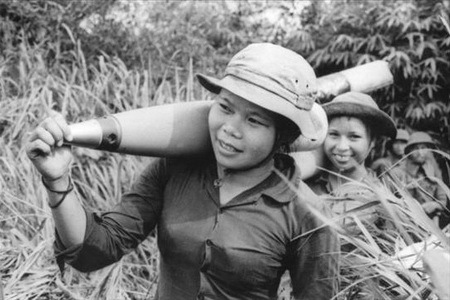 Of all the ordinance dropped on Laos, it was the cluster bombs that have had the most lasting lethal effect. 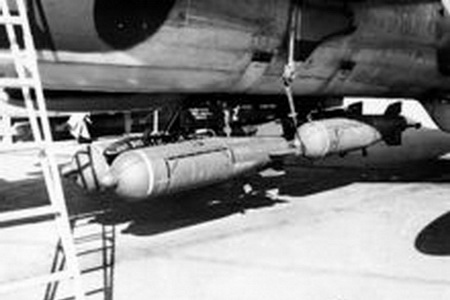 Each canister contained up to 600 bombies. 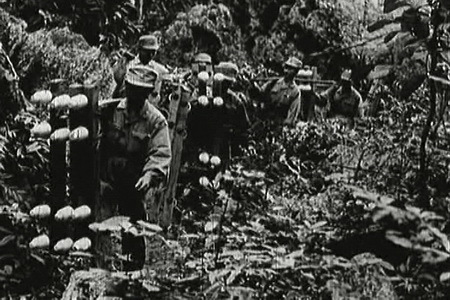 Over 270 million cluster bombs were dropped on Laos during the Vietnam War (210 million more bombs than were dropped on Iraq in 1991, 1998 and 2006 combined). The casings at least can be put to good use. You can grow onions in them. Up to 80 million bombies did not detonate. You can support your house with them. 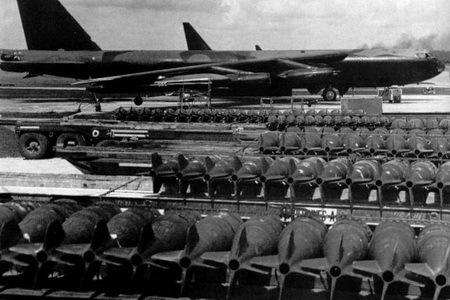 Nearly 40 years on, less than 1% of these munitions have been destroyed. 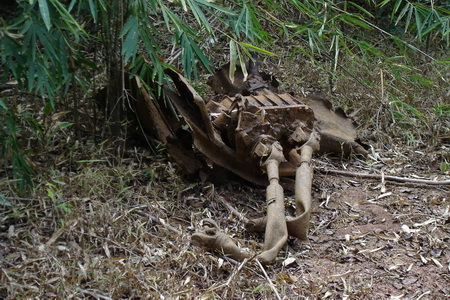 More than half of all confirmed cluster munitions casualties in the world have occurred in Laos. Or even your rice storage shed. Unfortunately they are a common site. Click the photo for a recent story in the New York Times newspaper. Even in river crossings. The Gopro camera has distorted the bombie a bit. Click the photo above for a recent story in the Guardian newspaper. 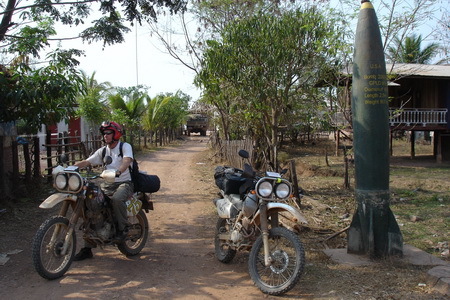 There are many commercial and non commercial UXO clearance operations all around Laos. Land is termed 'contaminated', as farmers are unable to use plots for fear of striking a cluster bomb. Due to their shape, bombies tend to stay near the surface. Unfortunately, every time the price of steel gets to a certain level, local people take cheap metal detectors and search for potentially fatal items. Local education campaigns do their best to keep children informed. A common site warning people which areas are safe. Best to stick to the yellow side, south of Chavan. Entertainment troupes performing for Trail workers. This graffiti still remains from one such performance in a cave south of the Mu Gia pass. Graffiti from the same cave is a stanza from a popular song played at that time. "Night and day I think of my loved ones at home". The Trail was protected by a formidable AA gun network like his 100mm AA shell from a KS-19 Russian AA gun. 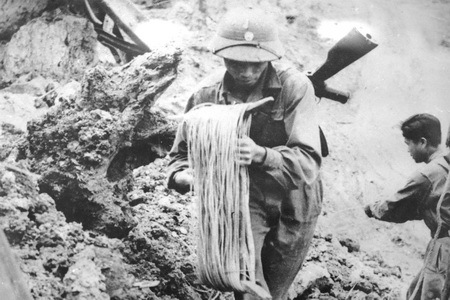 Spent shells found in the jungle west of La Hap. 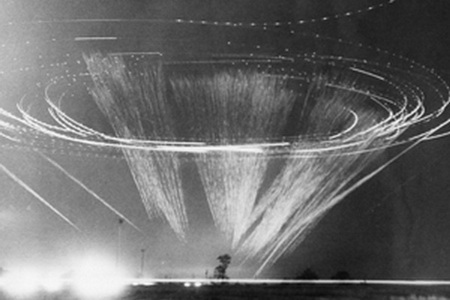 Groups of AA guns would typically target a 'box in the sky', and only fire five rounds when a plane approached it. Spent shells on the side of the road near Ban Laboy. 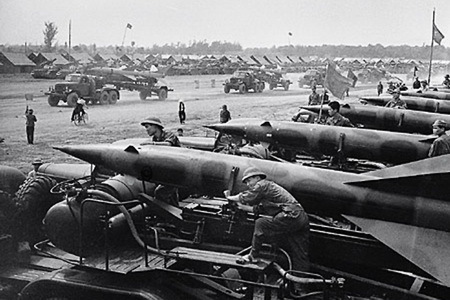 The guns were transported by armored tractors. 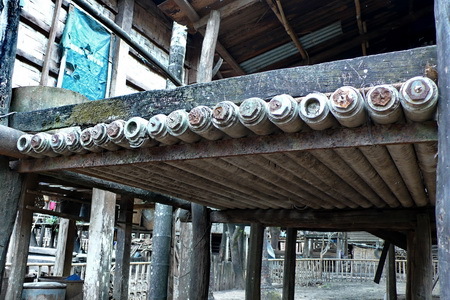 Like this one seen in Muong Nong. 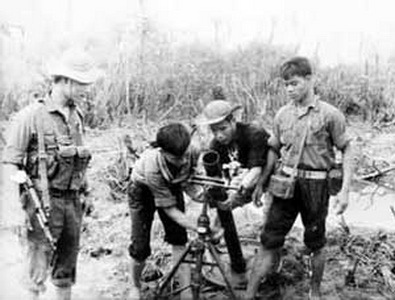 Commander Nguyen Dong Sy inspects a 57mm AA gun team. Like this one seen in Dak Cheung. 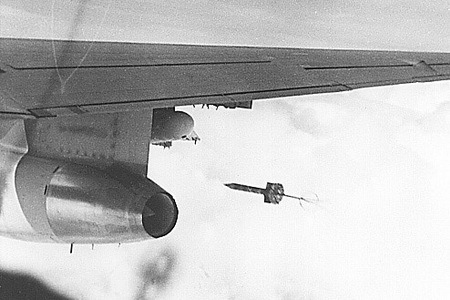 The Russian DShK 12.8mm machine gun was also an effective gun against low flighing planes. Though here it is only guarding the coop. It could be used as stand alone, fixed or attached to armour. Spent shells in an old bunker north of Ban Bak. 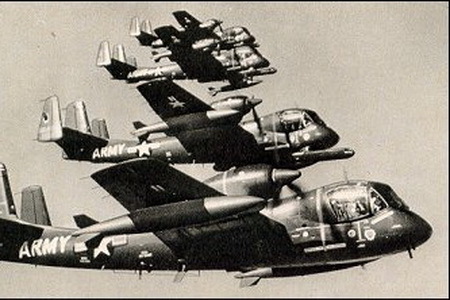 The OV-1 Mohawk, whose star on the fuselage is very similar in size to the part used as a window to the right. 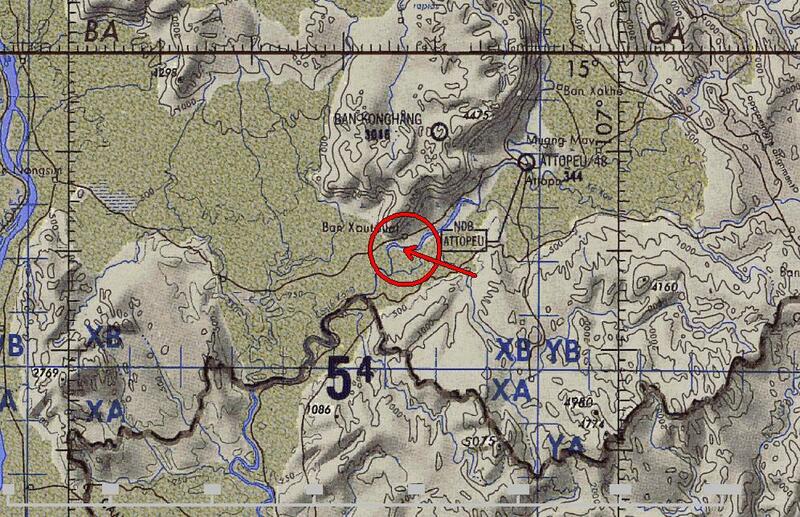 I came across this aircraft part very close to the village marked in the map below. 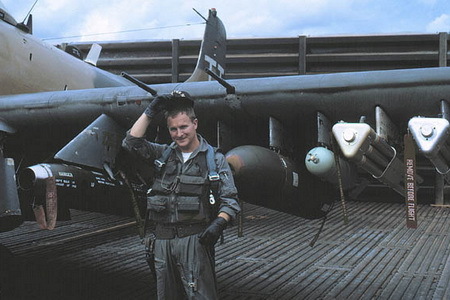 If you click on the map above, you will get the full story of the lost OV-1 Mohawk which I believe the star comes from. 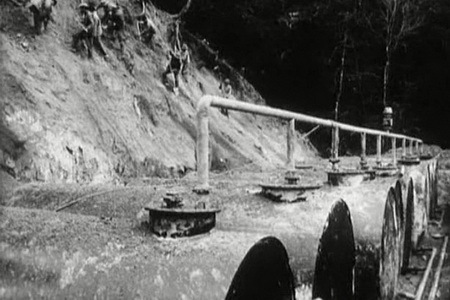 To keep the trucks going, the North Vietnamese had to build a pipeline, one of the longest in the world at the time. It could carry diesel, kerosene and petrol. All told it was some 1,400km long. There were numerous fuel depots along the length of the Trail. A much better alternative to the original plan which saw porters carry bladders of petrol on their backs. 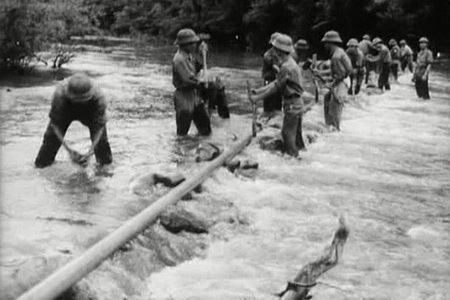 The entire network was installed by hand. Notice the couplings are the same. Along the Trail were numerous rivers. Some were crossed by fords. Others were crossed by ferries. 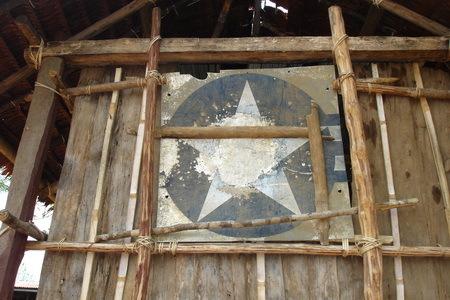 A remnant of which still exists at Ban Bak. 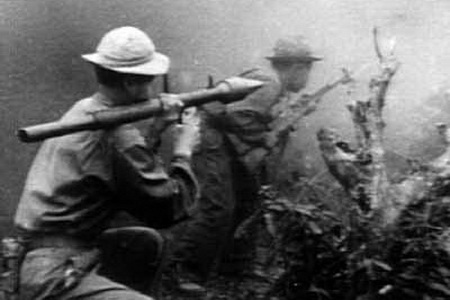 In southern Laos near the tri-border with Vietnam and Cambodia, US special forces set up a staging post called Leghorn. Its imposing location can still be seen while riding the Trail near the Cambodian border. It proved unassailable due its location on top of a steep limestone cliff, and assisted in many operations in that region. Local villages though made a trail to it some 10 years ago and removed most of the scrap metal left behind. 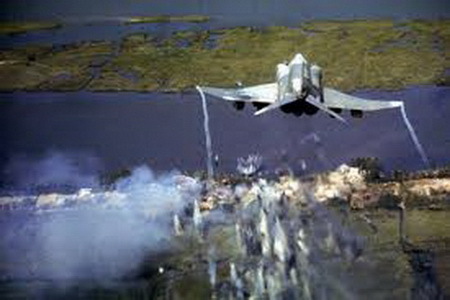 SAAM missiles were not used extensively on the Trail, as they were used primarily to defend North Vietnam. 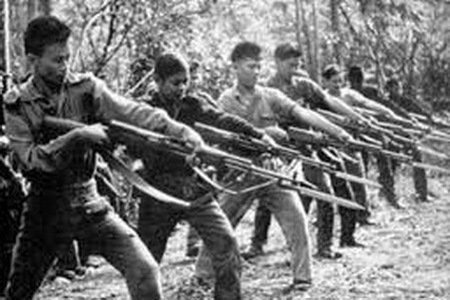 But they were used in the Mu Gia and Ban Laboy regions, and a number were left behind at the war's conclusion while on their way to south Vietnam. 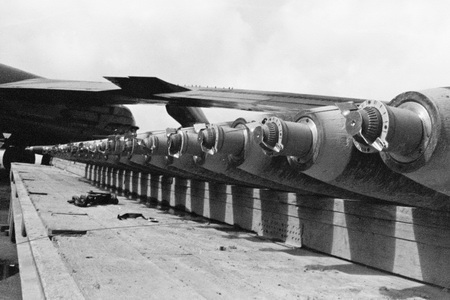 They proved effective is forcing planes to fly lower, thereby brining them within range of normal AA guns. At the base of the Mu Gia pass. They were transported in large cigar like tubes. Parts of which still litter the Trail. 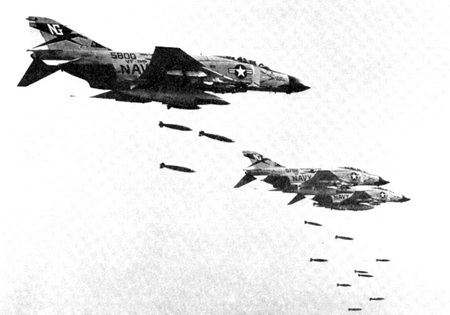 All told some 205 planes were shot down by them. The explosive warhead was at the front. 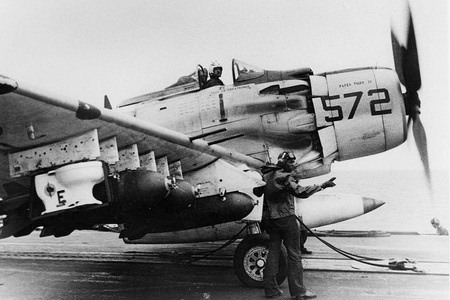 Early in the war a basic type of cluster bomb was used, which saw pineapple shaped bombies dropped out of tubes, in this case from an A1 Skyraider. The tubes make useful housing foundations. 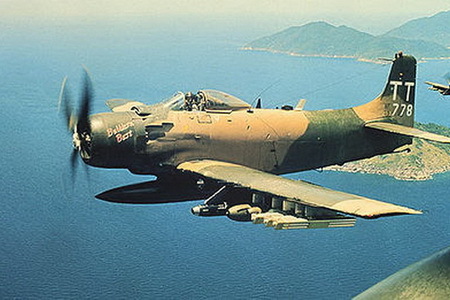 The A1 Skyraider proved a real workhorse due to its ability to soak up fire, high ordinance portage and ability to stay in the air for a long time. A favorite for search and rescue missions. 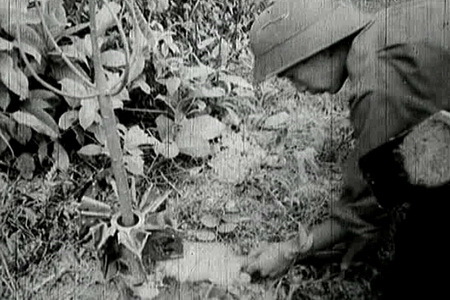 Notice the triangular shape of the tubes, here seen in a UXO camp in Attepeu. 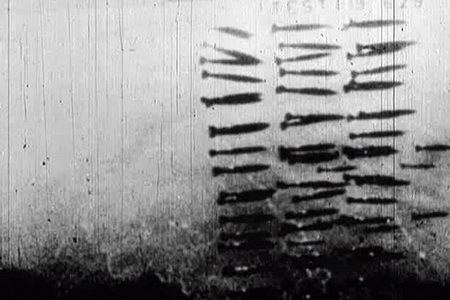 The cluster bombs dropped from these tubes proved to be useful as lamps, as can be seen in the bottom centre of this photo. As they still do so today, but this time next to a DVD player. There was a wire and wireless communication system, some 13,000km in length. North of Villabury. Notice that the insulators are the same. Discarded wire reels north of Ban Bak. 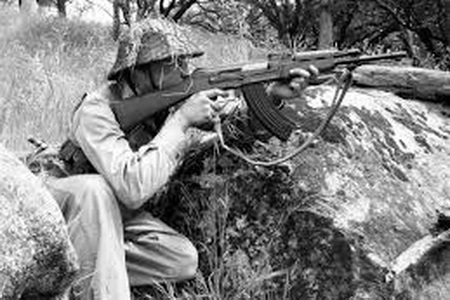 As was the AK-47 assault rifle. Typical breakfast on the Trail! Notice the water bottles at the centre bottom of the photo. Water bottles also find a modern day role as cow bells! There were many kinds of fuses used. Timed, impact, chemical etc. They make good cow bells. 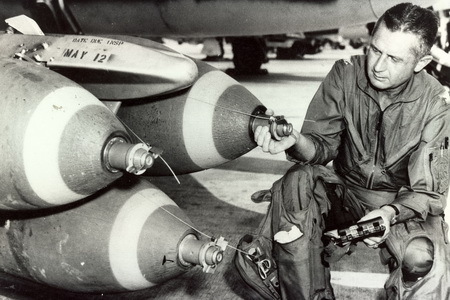 Notice the fuses at the front of the bomb. There was typically a backup on in the tail as well. 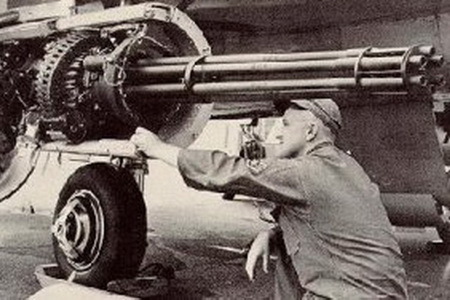 The multi barrel M-61 Gatling gun was very lethal. And found itself attached to helicopters, jets and gun ships. 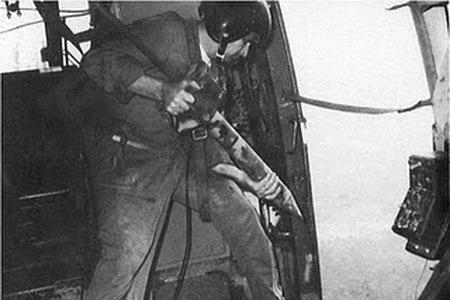 Especially when mounted out of the left side of the AC-130 Spectre Gunship. 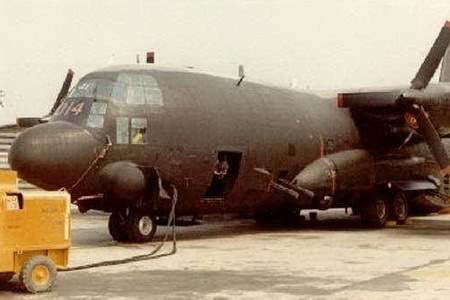 With infrared, night vision, 2 Gatling guns and a 105mm cannon, these Spectres were highly effective against trucks. 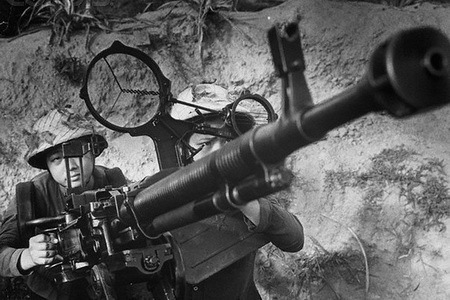 The M-61 could shoot an astonishing 6,000 rounds per minute. 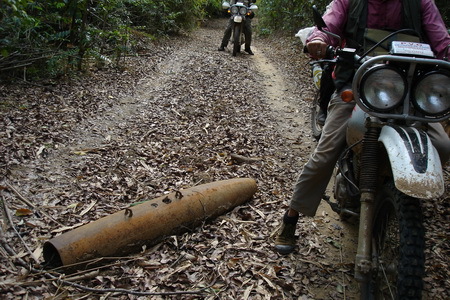 An unspent M-61 shell south of the Mu Gia pass. 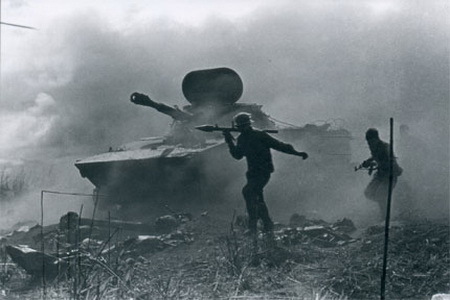 The PT-76 light amphibious tank in action in the 1971 Lam Son operation. A similar tank that was used to overrun the Lang Vey special forces base, just to the west of Khe Sanh, in 1968. 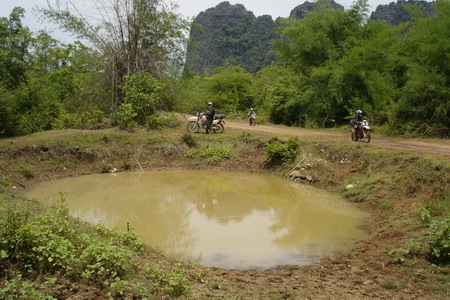 A crater north of Ban Bak. 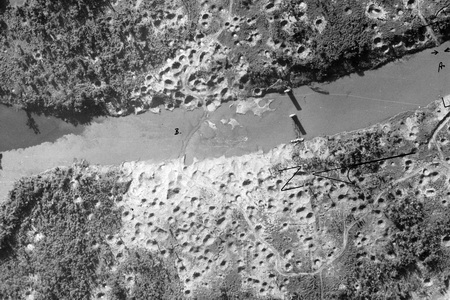 A heavily bombed river crossing, location unkown. 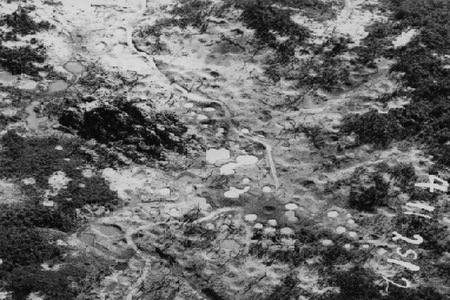 Craters in the Ban Phanop choke point. The Trail north of Villabury. Notice the fresh crater in the middle of the photo. 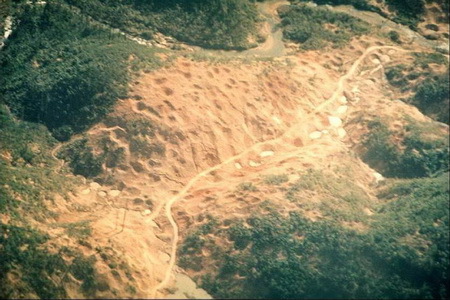 A crater south of Muong Nong. A crater at the base of the Mu Gia pass. The Falls choke point in far south Laos. A crater in the Mu Gia pass area. 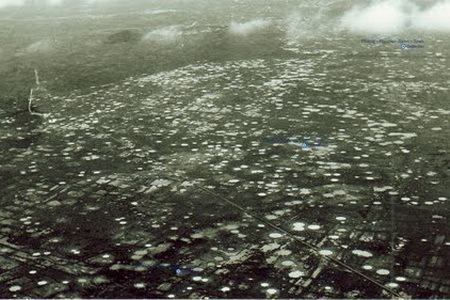 Results of a series of B-52 strikes along the Foxtrot choke point north of Sepon. Crater in the Ban Phanop valley. 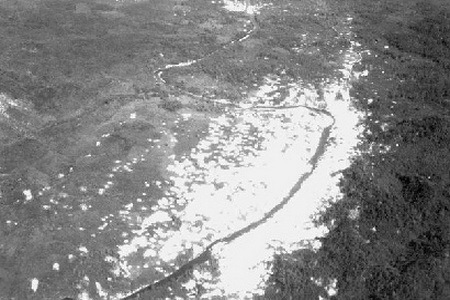 Thousand of seismic listening devices were dropped on the Trail as part of the elaborate 'Igloo White' program. The idea was to listen into night time activity on the Trail, so as to coordinate attacks in the regions where the trucks were heard. Early on they were dropped by hand. 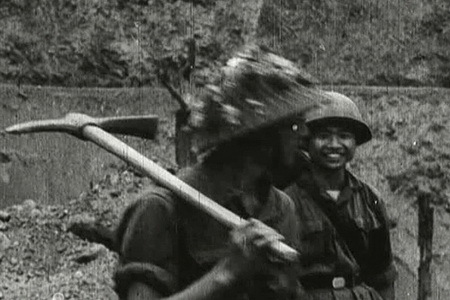 The Vietnamese counter measures included simply moving the sensors, fooling them with toads filled with tobacco, or having workers start up truck engines on bamboo poles at random locations each night. 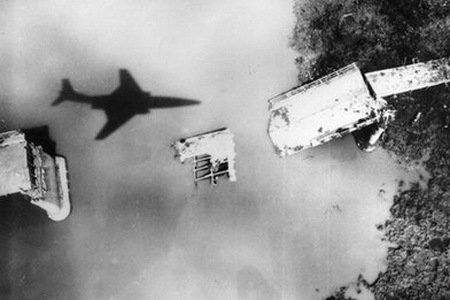 But as the Trail became more dangerous, they had to be dropped by jet. For more details about the Igloo White program, click on the photo above. 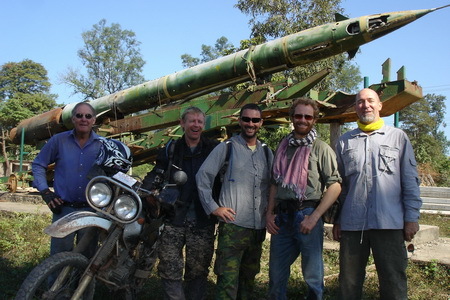 The entire program was controlled by the ultra secret base just over the Mekong river in Nakhon Phanom, Thailand. 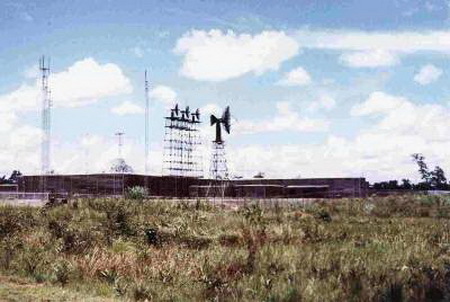 Which housed the largest computer in the world at the time. 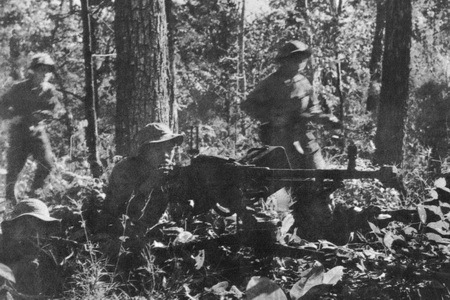 An NVA officer leads an attack during Operation Lam Son. 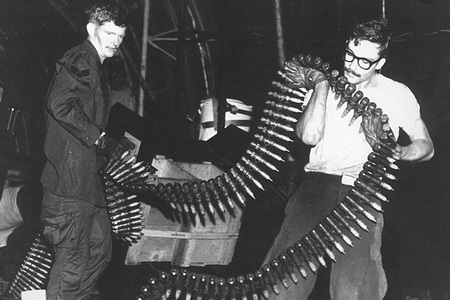 A similar pistol found in a scrap metal shop in Khe Sanh. 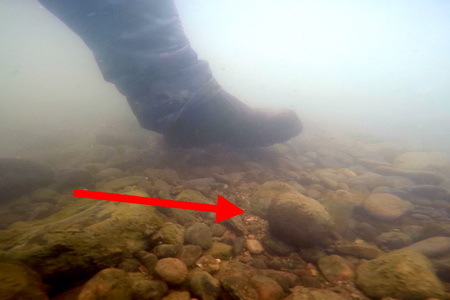 Notice the same steering wheel in this river bed. 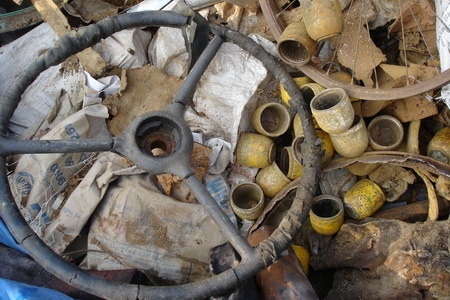 A similar steering wheel in a scrap yard near Sepon. 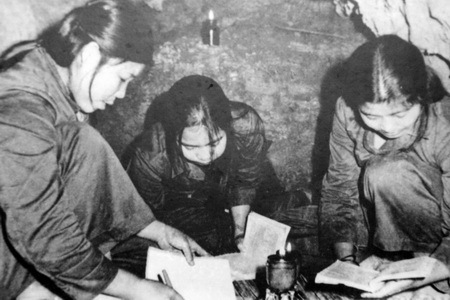 Women accounted for a large percentage of trail workers. A rocket or artillery shell found by road workers while widening the Trail north of Villabury. 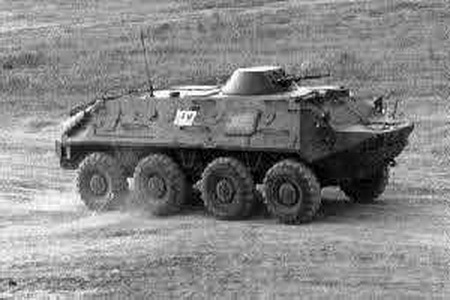 A Russian BTR troop carrier. A BTR gun turret in Muong Nong. Some 30,000 people, many of them women, kept the Trail open. Their tools litter the Trail. Many were only 18 or 19 years old. 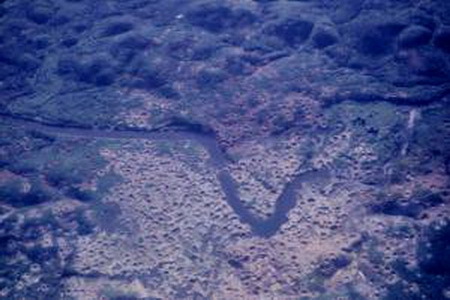 A pick head found near Ta Oi. Workers use mallets to install traffic signs. Notice that the hammer to the right is made from the clamp from a bomb. The Ban Phanop area was a natural choke point as the trucks heading southwards had no choice but to drive through a small opening in the karst rock formations. The karst there still shows signs of having been shattered. 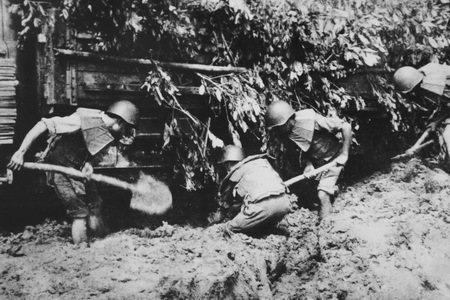 At regular intervals along the Trail were way stations, which housed hospitals, repair stations and protective bunkers for the trucks. 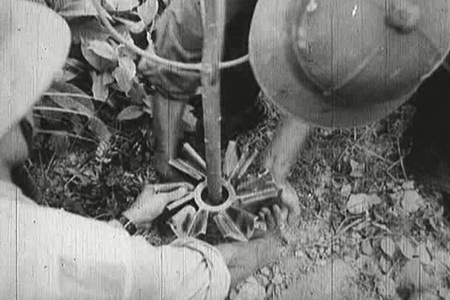 A truck axle dragged out of the jungle south of Ta Oi. At the Trail's height, there were some 70-odd such stations. Truck parts found north of Kaleum. Early on in the conflict all bridges of note were cut off. This old French bridge remains destroyed.